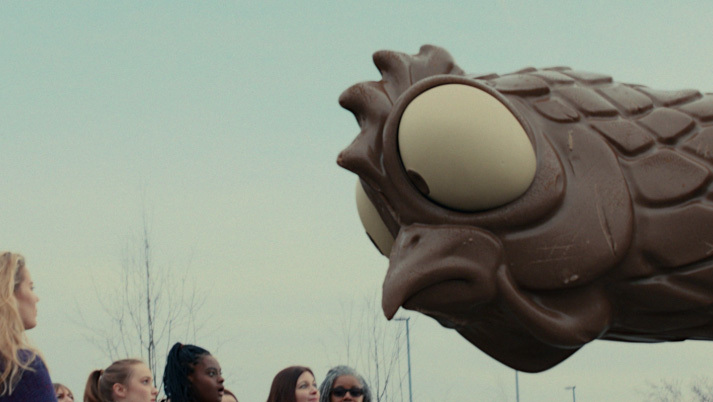 Which came first, the 30-foot-tall chocolate chicken or the 200-pound candy egg? Whoa, that bird was pretty mellow about folks taking her picture—unlike King Kong, who exhibited a famously fowl reaction to the paparazzi in similar circumstances. Wonder if Tom Jones' wailing on the soundtrack fried her giblets? Ah well, it doesn't show. After all: "She always knows her place. She's got style, she's got grace—she's a winner." "We have Framestore in London to thank for the amazing looking hen," Andy Booth, VCCP creative director, tells AdFreak. "Making the surface look like real chocolate was a challenge. Our measure was, 'Would we actually want to eat it?' If not, we weren't there yet." Bringing the puce poultry convincingly to life also created challenges. "Not only did we have to consider the way a real hen would move, but also the sheer size and weight of ours and how that would look," Booth says. "Our start point was the way dinosaurs carry themselves in films like Jurassic Park." During the shoot, the cast reacted to a 30-foot-high stick that stood in for the hen, which was added later in production. Glue Factory director Gary Freedman captures just the right sense of cheek in the spot, which is supported by digital, out-of-home, point-of-sale and social elements (the latter hashtagged #GiantHen, naturally). "We thought the client may be nervous about the Easter Bunny being portrayed as being so upset about the arrival of the hen as a competitor," says Booth, "but they embraced it all wholeheartedly." Yeah, it takes a courageous client to put a guy in a rabbit suit and let him rail against a giant chocolate chicken. "People have quickly taken the giant hen to their hearts," Booth says. "In the first 24 hours alone, the spot had 650,000 views on Facebook and the #GiantHen tag had 3.9 million impressions."